On Thursday, September 25, 2008, I saw Second Skin at a screening at The Calhoun School in New York City and was quite impressed. 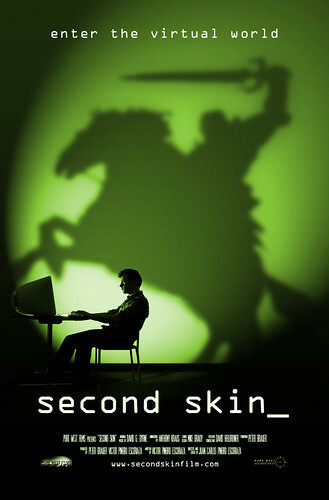 Second Skin is an honest and real look into the lives individuals whom are actively engaged in MMORPG’s, i.e. ‘Gamers’. The film, however, is not an all inclusive look of those in virtual spaces focusing heavily on gamers especially those involved with World of Warcraft, and Everquest. There are brief mentions of non-MMOG platforms such as Second Life, but not the core of the film. In reality Second Skin is a starting point in the discussion of MMOG’s by exploring the many aspects of gamers and their involvement in these worlds. After missing the first Second Skin screening in New York City (and all previous screenings), I was delighted to find out there’s another screening this week! The next Second Skin screening in NYC happens on September 25th, 2008 through the Calhoun School, in the Mary Lea Johnson Performing Arts Center, 433 West End Ave. at 81st St. You can sign up for tickets through the Calhoun School ($10 for general admission/$5 for students).